The theme for the River Cottage Diary 2008 is regional and local food. We celebrate the food and food heroes of 12 different regions of the UK, with information about what is especially good from each area, lists of seasonal fruit, vegetables and meat, and 36 classic local recipes on perforated card that you can use again and again. This year, Hugh and the River Cottage team are tackling the big national supermarkets as they attempt to set up their own shop in the town of Axminster in Devon, teaming up with local farmers and food specialists. 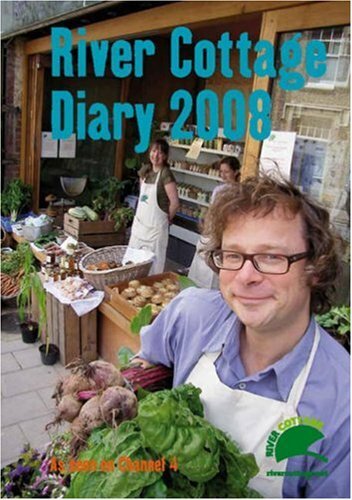 The River Cottage Diary 2008 will have a dedicated section about the project, complete with profiles of eight of Axminster’s top local producers. As always in this week-to-view diary, included are useful foodie dates (including many of the major food festivals and agricultural shows), websites, planting tables, seasonality charts, weights and measures and even moon phases.